You don’t have to tell me; I know I have enough yarn in the stash. 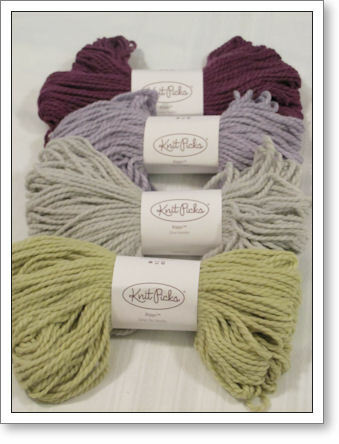 But then last week, I saw Knit Picks’ new yarn, which is a new bulky yarn with a funny name. It’s called, Biggo, and I had to give it a try. I’m nearly done with my charity scarf for work. And, there aren’t that many donations coming in, so I feel like I have to make more. Except that I am a slow knitter. So I’ve been looking for a bulky, washable yarn, and then this one just fell in my lap at just the right time. Biggo is 50% merino and 50% nylon. I don’t know that much about fiber construction but it looks basically unspun and then wrapped in a thread. It’s BIG, hence the name, so it will knit up quickly. And it’s SO squishy and soft. I bought 4 hanks, and I’m actually hoping I’ll get two scarves out of it. Secretly, I want one for me. I think it’s going to be great for what I’m going to use it for but I have to wonder how it will hold up in something like a sweater. It’ll be interesting to see what others think of this yarn. Hopefully I’ll have an FO report on the other scarf soon. Keep on knitting!